Here is a great 40 minute video narrated by actor and Martin guitar player Jeff Daniels. 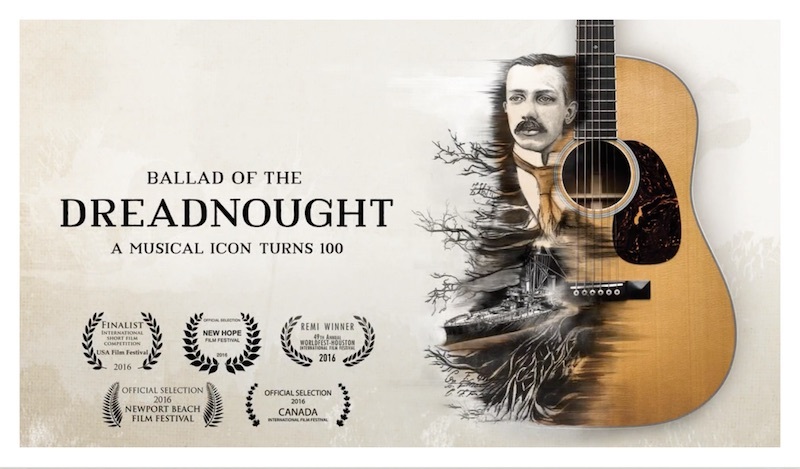 The Ballad of the Dreadnought traces the rise of the Martin Dreadnought from selling only a few dozen guitars for its first 20 years to becoming the musical companion played in almost every musical genre in every corner of the world. For 100 years (1916-2016), the Martin Dreadnought has stood the test of time and survived endlessly evolving musical tastes becoming the musical companion for countless artists throughout music’s history. From Crosby, Stills and Nash on stage for the second time together at Woodstock with a D-45 to Seth Avett discovering countless songs waiting inside his Martin D-35, artists such as Rosanne Cash, Roger McGuinn, Steve Miller, Vince Gill, Jason Isbell, Sturgill Simpson and Del McCoury to name a few, will take you on a musical journey as they lovingly recall moments where they stood proudly behind their trusted Martin Dreadnoughts. Visit this link to view the video. It is under copyright so we cannot embed it on our site.